Every seller knows that there home should have “curb appeal.” But what exactly does that mean? Trim the vegetation around your home — particularly those bushes that may conceal windows. Then be sure that your landscaping looks great all of the time, even if you have to hire a gardener while your home is listed. Invite visitors into your home by placing yellow flowers near or at the entry porch. Yellow draws the eye, and potential buyers will feel immediately welcome. Make sure your front door looks its best and has a fresh coat of paint and hardware or it is cleaned with a new doormat. If you can budget it, a fresh paint job does wonders for a dingy house. Drive around your town to find color schemes that are appealing. If you brainstorm, you’ll find that there’s a solution to most problems—one that lets you stay within your budget. The trick is to find the areas where improvements are needed, then work on them as best you can. A large percentage of home buyers decide whether or not to look inside a house or based on its curb appeal. 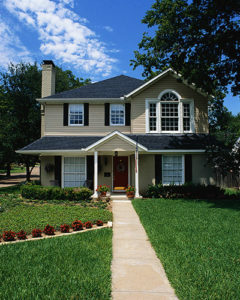 You can help make sure they want to come inside your house by spending some time working on the exterior appearance. Park where a potential buyer would and walk towards the house, looking around you as if it were your first visit – Is the approach clean and tidy? What could you do to make it more attractive? Take photos of the home’s exterior. If you have a digital camera, view the color versions first, then remove the color and look at it in black and white, because it’s easier to see problems when color isn’t around to affect our senses. Make a list of the problem areas you discovered. Tackle clean up and repair chores first, then put some time into projects that make the grounds more attractive. Pressure-wash dirty siding and dingy decks. Mow the lawn. Get rid of weeds. Trim tree limbs that are near or touching the home’s roof. Buyers driving by will try their best to see your back yard. If it’s visible from another street or from someone’s driveway, include it in your curb appeal efforts. Add low voltage lighting along your driveway, sidewalks, and near important landscaping elements. Make sure lighting that’s visible through front doors and windows enhances the home’s appearance. There are times that adding elements to your landscaping can improve curb appeal, but there are other times when removing something is even more effective. For example, we had a listing for a large brick house with large white columns. Tall evergreens, planted in front of each column, had grown taller than the roof. They obscured the columns and windows and made it difficult to see the front of the house. We suggested that the owner remove them. She trimmed them back, but it didn’t do the trick — they were unattractive and still kept potential buyers from seeing the true character of the house. I sold the house to a couple who could see past the trees. One of their first tasks after closing was to yank them out of the ground, instantly boosting the home’s curb appeal. Most buyers cannot visualize changes, and often won’t take a second look at a house if the first look doesn’t appeal to them. Home buyers who can visualize changes, and are prepared to make them, expect you to reduce the price of the house to compensate for the work they plan to do.